Rawr... And A Late Review, Too. Well, hello and Happy New Year! Hope it's been a good one for everyone so far. I've had a decent start to the year. I really enjoyed the recent long weekend as I actually got to spend some time in the sewing room. I made a skirt. In a weekend. Can you believe it? I can't remember the last time I saw a project through start to finish over a weekend. Not since before baby. I bought this leopard print double knit fabric some time ago with a different plan in mind. This was a case of not checking the ruler on the screen shot when ordering fabric online. I thought the print was going to be much smaller. Much, much smaller. When the fabric arrived, I looked at the enormous spots and wondered what the hell I was going to do with it. I caught a glimpse of it draped around my legs while I was folding it to put away and I though maxi skirt. 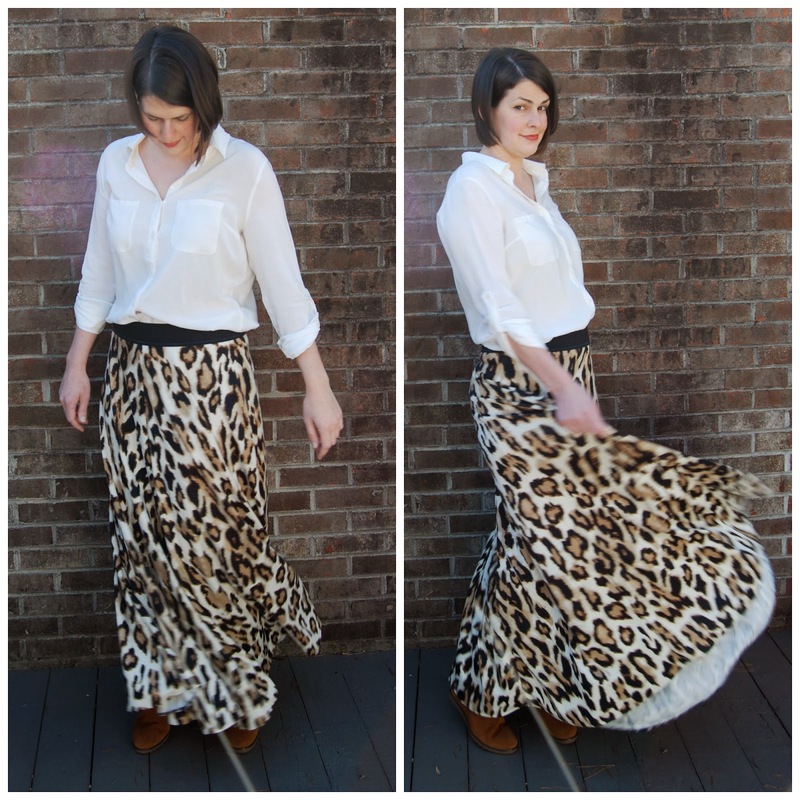 Big, swishy maxi skirt. Sometimes you just have to let the fabric tell you what it wants to be. 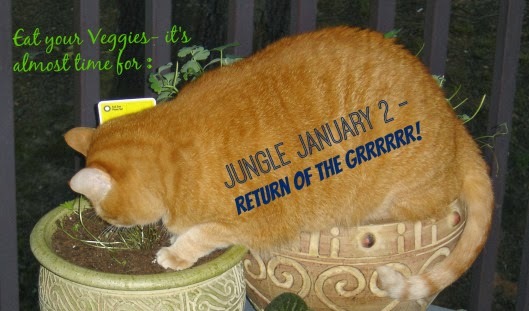 And since it's Jungle January, I figured I better go ahead and do what the fabric told me to. I decided on a half circle skirt for ultimate twirly-ness. I've wanted to make a half circle maxi skirt for a while now but the math has always scared me off. 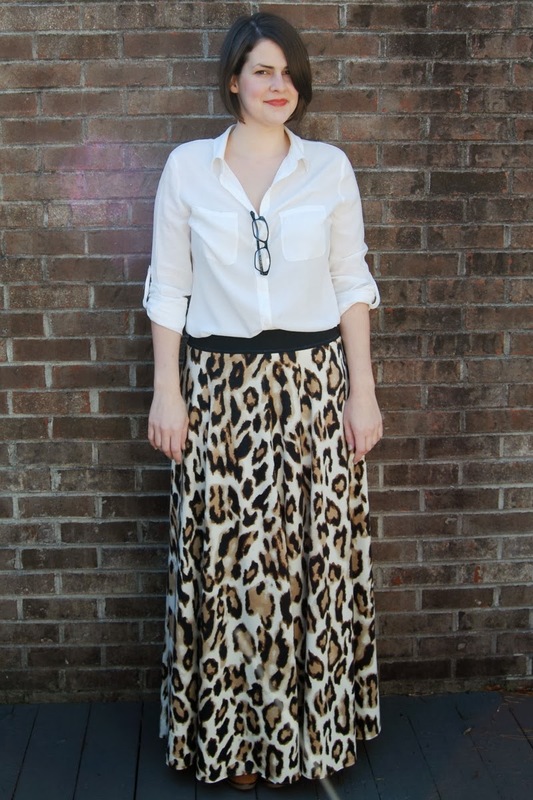 I read lots of blog tutorials and online magazine articles on drafting a circle skirt. But this one by By Hand London clicked. I intended on only drawing out the waistline circumference on paper and then using that to draw my half pattern piece directly on the fabric. When I realized I would have to sew the skirt in panels, I couldn't wrap my head around how to divide it up. So I ended up drawing out a gigantic half of a half circle maxi skirt pattern piece on paper. I mean, the pattern piece is seriously huge. At least I have it now and can use it to make any length half circle skirt. Here's a shot of the skirt panels cut out. Just for reference as to how much fabric makes up this skirt. 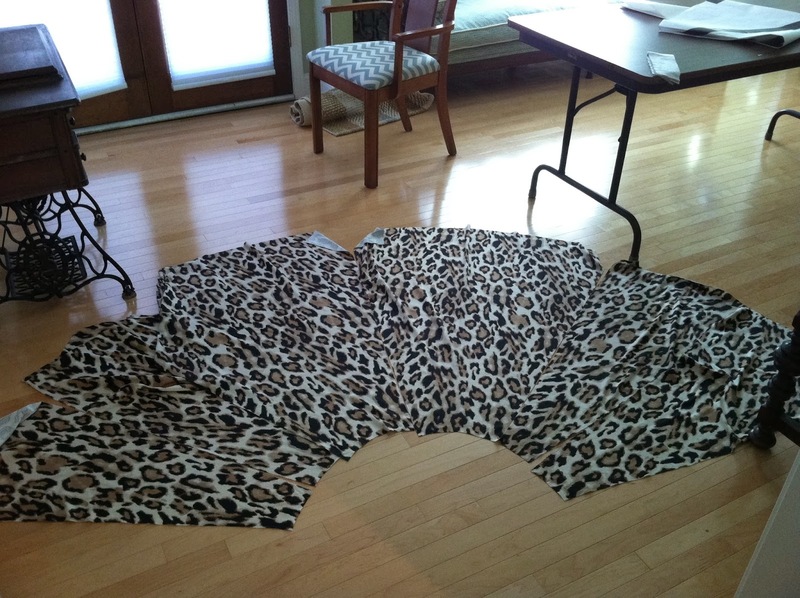 I had three yards of this leopard print double knit, 60 inches wide. I used almost every bit of it. Luckily the print isn't directional. The front of the skirt is made up of two panels and the back is four. The skirt is satisfyingly swishy when I walk and turn around. Which I tried to capture in the top photo, hence the silly face. I know double knit seems like a strange fabric to make a half circle skirt from. This double knit is quite a bit lighter and has more drape than any double knit I've ever used before. In fact, I would just call it a heavy jersey. It's pretty stretchy, too. That being said, the skirt is really heavy with all that fabric. I planned on putting in a straight self fabric waistband and maybe an invisible zip if I needed it. But the weight of the skirt was too much. I used some wide knit elastic as the waistband and left it exposed, which was a very easy finish. I did a quick and dirty baby hem at the bottom. I serged the edge first with the differential feed cranked up. Then I just flipped up the serged edge and straight stitched. Anyway, I'm glad Jungle January peer pressured inspired me to make this skirt! Especially since the fabric is not my typical style. I'm still a little scarred from my last cat print garment. I ended up with a skirt that I love and will wear often. I even put on a bit of lipstick for these photos. 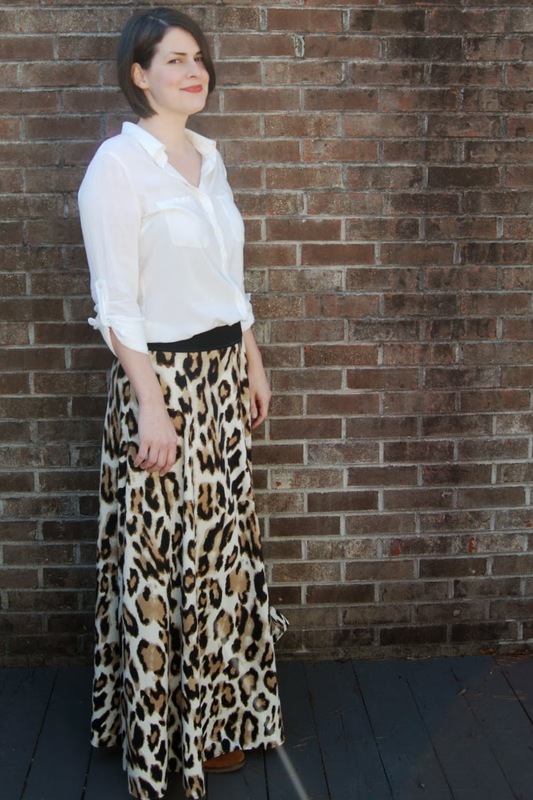 What is it about leopard print that makes you want to wear red lipstick? Ok, so I'm tacking on a very late year end review to the end of this post because I don't think it's worth a post of it's own. I wasn't going to do this again, but Joy's review convinced me otherwise. 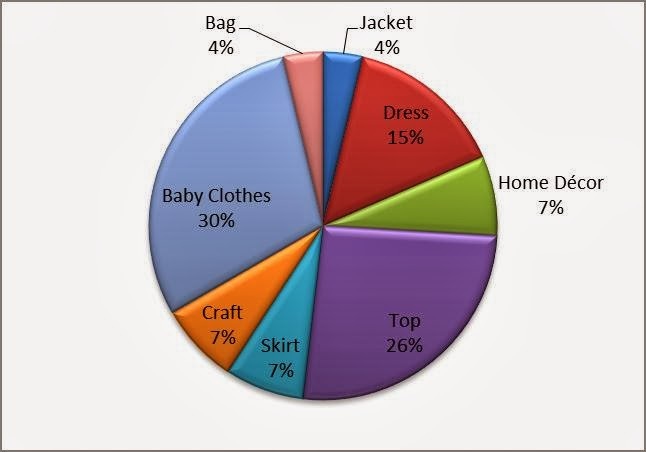 I do love a good pie chart (neeeerrrrd!). I had some major life events this year. I made my most important masterpiece to date :). And all of those life changes, of course, affected my sewing time. But not as much as I thought. It was nice to see this little bit of info in graphic form. I made 30 items altogether. Didn't make anything in April for good reason. 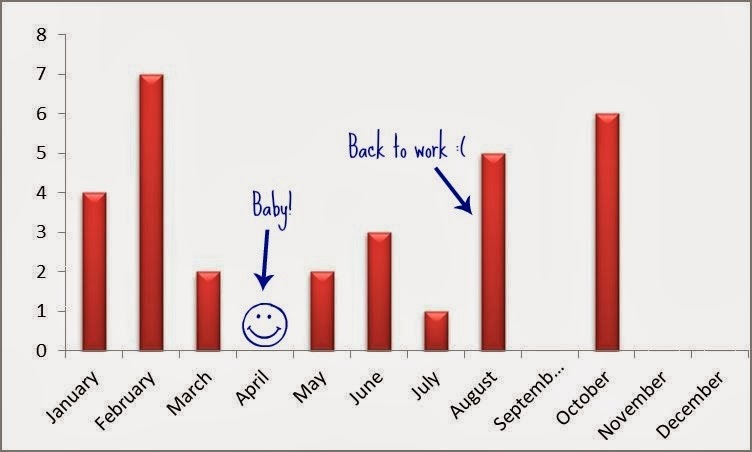 And then my output majorly slowed since going back to work in August, except for a weird burst of productivity in October. 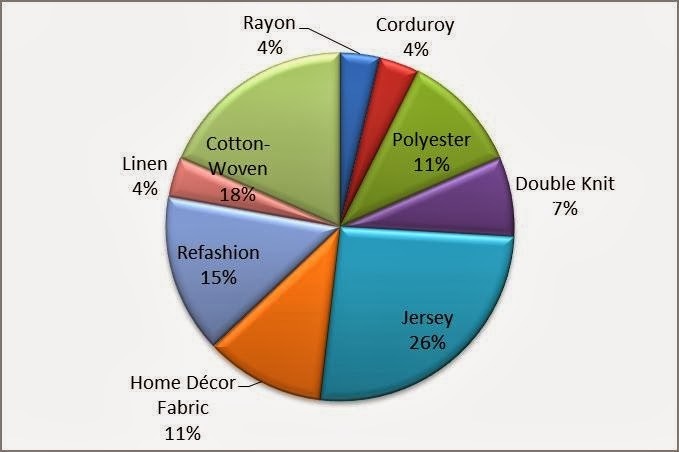 Like last year, I can see that I like to sew a variety of items. I'll use that cliche that I'm a jack of all trades, but master of none. The home decor and craft sewing were all projects for baby. As were all the baby clothes. If you include the bag I made to cart around all the baby stuff, that's about fifty percent of my sewing done for baby Jane. I consider that a pretty good split- 50/50! I used a lot of knits this year. A direct result of being pregnant and then being a new mom. Knits are easy to wear. I kind of miss wearing some of my woven shirts and things but life just isn't conducive to ironing right now. Eh. 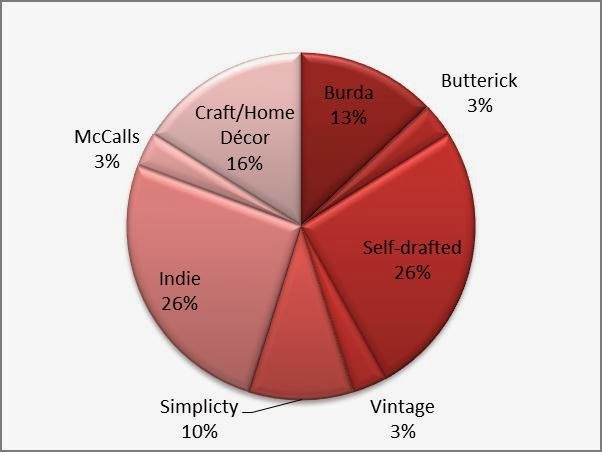 And by pattern type. Not much to say about this one. I didn't use as many big 4 patterns as I did previously. Anyway, not too shabby. Life is good and I am getting in to a groove, with tiny bits of sewing time here and there. Here's to a happy and healthy 2014!